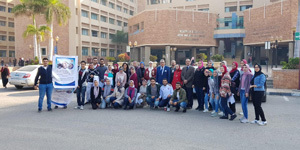 Within the framework of the community service endeavours exerted by Pharos University, a medical aid convoy set off to the Martyr Waleed Sobhy School on Tuesday 27/11/2018. The convoy was sent in coordination with the Education Directorate in Alexandria. The PUA delegation was comprised of staff members of some PUA faculties including the faculty of Dentistry, the faculty of Physical Therapy and the faculty of Allied Medical Sciences. The staff of the faculty of dentistry offered 300 primary students free medical examinations and distributed toothbrushes and toothpastes among them. Meanwhile, the Physical Therapy delegates gave the students some useful advices on how to improve their postures and to properly carry their school backpacks. The school students also watched a video, made by the staff of the faculty of Allied Medical Sciences on the importance of healthy eating and the ideal weight and height for their age. Other academic staff members also went in the convoy; Prof. Hisham Elshimy, Dr. Essam Ghoniem, Dr. Rania Hassan, Teacher Assistant. Fathy Shokry, Eng. Amr Mamdouh, Ms. Aya Elrakaybey and Mr. Karim Hassan, a representative of the Student Activities Administration. The coordination of the convoy was managed under the supervision of Prof. Ramadan Abu El-Ala, the Vice President of Community Service and Environment Development Affairs.